Remember this cover? I love it. I actually love it so much that even though my original idea was something grittier–an old gull feather, gap-toothed and roughened, turning to flame–and even though the font suggested something other than a story about three kids living oh-so-briefly on the street together, I gave an enthusiastic yes as soon as I saw it. I have it framed and hanging over my desk, courtesy of my brother. Phoenix was an experiment of a story. It was also an experiment in publishing for me. The number of markets for novelettes is…small. I tried Giganotosaurus and got a nice rejection with a try again note. (I did, because that was the year of two novelettes. Luckily The King’s Huntsman found a home there a few months later.) I sat around for a while, wondering what to do with it. Well, to be honest, it was less thinking and more putting it in the file of things that I don’t what to do with, because that’s how it goes sometimes. I considered self-publishing it. (That’s where my cover idea came in.) I read up on it. I talked it over with Dear Spouse. I thought about it more. In my heart, I knew the answer. I was chicken. At that moment, it was easier to think about burying the story than it was to think about putting it into the world on my own. Then Musa came along. It was new, it was e-book only, it was open to all sorts of stories, at all sorts of lengths. Their contract was available to read online, and it was easy to understand, and they provided covers and formatting and editing and split story profits 50/50. Given my status as chicken, and my dearth of options, I decided to submit it there. I never thought of it as a young adult story, but it ended up in the hands of the YA editor at that time, and she provided me with a very persuasive argument for why it was. She agreed to a few amendments to the contract, I signed it, and Phoenix was birthed as an e-book. A very short one. It’s a gamble working with brand new publishers. Don’t ever assume it isn’t. 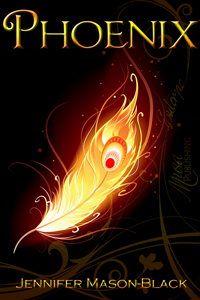 I submitted Phoenix because it was a novelette, the equivalent of a few days work for me. I signed the contract because I asked them to remove the clause that gave them right of first refusal on any related stories. See, Phoenix is kin to Wren and The Lost. Secret kin, kind of like the royal child raised far from the castle to avoid the violent intrigue within. I was happy to gamble with a novelette, but not with one of my novels. The contract was for three years, and would have ended this May. Things have sped up. Musa closes on February 28. It happens, to many many presses of all kinds. When I signed my contract, I did so knowing that the odds were against them. The odds were against Phoenix too. My sales goals were low. I was pleased to exceed them. I had a very small, very manageable experience of marketing an e-book. I learned a little about how to do that while working with my personality, which is not of the “BUY NOW, BUY BUY BUY” variety. I had an e-book with a beautiful design, and it taught me gratitude to the people who think about how a story is presented, who make an art of it. It’s been good. And now it’s just about over. Phoenix is still available through all the various online vendors through the 28th. It’s on sale at Musa, 80% off, which I think brings it down to $0.40? After Saturday, the rights return to me. The cover returns to pixels. The story settles back into my files, resting among its Aware brethren. I don’t think it will stay there forever, but it will for now. I hope to someday have an Aware story collection, and Phoenix would certainly be part of it. But for now, a pause. A passing. Remember: The thing about stories is that they’ve got to have hope. As threatened, the link for the LASR poll for Best Book of 2012 is here. I have one request of anyone who may be tempted to vote for Phoenix: please only do so if you’ve read and enjoyed it. I say this not to force people to read Phoenix, but to satisfy my sense of fair play. I promised more details about Phoenix, including embarrassing ones. First, I have to satisfy my own curiosity. The thing about WordPress, for those of you who don’t blog, is that you’re provided a limited amount of statistics about your readers. You don’t know, for example, the specific area a visit might originate from, but you do know the country. Some search terms show up, so when people google “driftwood clocks” and find their way here, I can see that. Because I’m more curious than a box of toddlers, I can’t help but notice the stats trends. When all of a sudden there are many more people stopping by after googling “She Walked Out The Door,” it makes the back of my brain itch. Why the sudden interest? One possibility is that the searching parties have been assigned the story for their high school English class (online syllabi–they’re easy to find). If that’s the case, if you’re a high school student who’s had to read “She Walked Out The Door” as a case study in POV, please say hi. In the comments, in an email, via a balloonogram…I welcome most forms of communication. In exchange, I promise to give you the five cent tour on how the story got written, and share the truth about exactly how much thought goes into some story details. Okay, on to Phoenix, Truth or Dare version. All of the other things I’ve said about Phoenix are also true, but the embarrassing thing is that I wrote the first draft as an experiment in writing like Stephen King. Yes, it’s fair to say I missed my target. By miles. It’s okay. I prefer Phoenix the way it is, and part of the fun of writing is trying on ten thousand hats, hopefully not all at once, and discovering which ones suit your face and which ones make you look like a giant fungus. So, that’s what Phoenix is not. I’m not totally sure what it is. The simple answer is that it’s a story about three kids, runaways, who end up living together in an abandoned factory for a brief period before violence drives them away on their separate journeys. It’s told by Tucker, now a middle-aged man who devotes part of his life to doing what he can for kids in trouble. There’s some ambiguity about what happens, which I like. I know the correct answer is that I plotted everything out, and that I know the truth about Tucker, Gabriel, and Kelsey. I think Tucker’s story is pretty well laid out, and Gabriel’s is a long involved one that I hope will make it to publication some day. And Kelsey? That’s the question, isn’t it? I have my own answers about her, but I think I can’t share them. It doesn’t seem fair to me to leave things open to a reader’s imagination, and then impose my answers afterward. If you really want to know what I think, you have to tell me what you think first. I’ll be doing another post about Phoenix for the Euterpe blog later in February. I’ll add a link once it’s up. I woke up this morning to a warm rainy day. I’ll be going to bed to a wintery cold one. Thank goodness we have the flu in my house and I have feverish children to snuggle. Okay, maybe I’m not really thankful about that, but I gave it the old college try. So, remember Phoenix? Last year it received a very kind review from Long and Short Reviews (LASR), in which the reviewer gave it a “Best Book” rating. On Monday I was notified that LASR will be conducting an online poll during the first two weeks of February to determine the Best Book of 2012, using a list of books that have received the “Best Book” rating. What does this mean? Well, if your great love is voting in online polls AND you’ve read and enjoyed Phoenix (or any other book on the list), it means that starting tomorrow you can vote. Yay, right? February suddenly looks a little brighter, doesn’t it? I’ll be back tomorrow with a link. Also, maybe some other facts about Phoenix, maybe even an embarrassing one, just to make up for the link. It appears that I will not be posting my my first writer interview this week, due to indulging in non-interview related conversation instead, but I have high hopes for next week. Actually, let’s call it plans instead of hopes. That makes it sound so much more organized. I woke up this morning to very excited children taking a picture of a garter snake resting in the top of the flowers just outside the bedroom window. I’ve seen snakes in plants before, but never just snoozing there. As soon as the sunlight hit the area, the snake was off on its snake business. 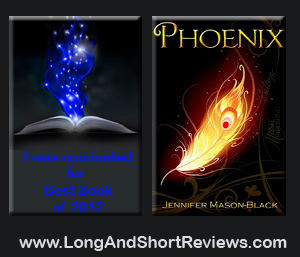 For those of you who enjoy reading reviews, a new one of Phoenix can be found here. I’m continually amazed by book bloggers. The thought of reading and reviewing multiple books a week exhausts me. I tip my hat to them. Speaking of book bloggers, Mera’s YA Book List is hosting the Euterpe authors this week. There are daily blog posts and author/character interviews, as well as chances to win Euterpe books. I encourage everyone to drop by and check it out. It’s been a week of lots of good things for me. I’d like to hear about good things for other people now. Yes, it’s 1:40 on a Friday afternoon and I’m asking you to tell me your good news. Writing news is good. Rain on parched earth news is good. Getting eight consecutive hours of sleep news is awesome. Tell me what’s made your world a little brighter this week. As an added bonus, let’s throw Phoenix in the mix. If you share good news and also want a copy of Phoenix, say so. If there’s more than one request, we’ll have one of our fabulous kid-run drawings and someone will win. Comments are absolutely open. I’ll leave them that way until tomorrow evening. It was a lovely surprise to discover a new review of Phoenix this morning. If you’re so inclined, check out Long and Short Reviews. I never posted that Specutopia is now available at the website, did I? It is, and that means that it’s available in PDF form, for those of you (like me) who don’t have e-readers. Also available at the website, Greg Mellor’s lovely story as a free read. Specutopia is also offering a free copy of issue one to reviewers. Information can be found here. Hey! It makes it really hard to wait in line at the Registry when the Registry’s not in the place it’s supposed to be! Totally great that the nice man wearing this tee shirt was able to take my check eventually, but it would have been even more awesome had I been able to find his office where the website said it would be. But that’s all water under the bridge. You don’t want to hear about that. You want to hear about winners. The answer? Everyone wins! That’s how I play this game. At least that’s how I play it when I have three awesome contestants. Mary and Julia, if you’d like a copy of Phoenix, please email me with your preference as to file type. I can send you either a PDF or something suitable for a Kindle or a Nook. Are there more types? I think they’re all available. Just let me know. My email is on the About Me page. What about Nancy? Nancy is the sort of person who is unfailingly supportive. Nancy is the kind of woman who will listen to a garbled message on an answering machine and manage to pluck out the essential “please enter a contest on my blog so I’m not lonely” bit and go right out and do it. In short, Nancy is the kind of friend every writer needs. So she doesn’t get a copy of Phoenix. Instead, she gets a hard copy of Wren, hopefully in another week or so. Prize or punishment? It remains to be seen.